Those of you who follow this blog will know that you get short-changed when it comes to desserts and other sweet things. Every so often I feel I ought to remedy that so I've been thinking for a while about writing about strawberries which are still plentiful and cheap despite being past their peak season. 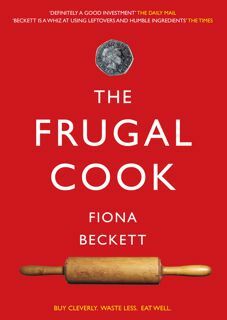 Prompted by Niki Segnit's brilliant The Flavour Thesaurus (a fantastic book about how to marry flavours in your cooking) I was thinking along the lines of strawberries and cinnamon. Initially a crumble, though I worried that it might make the strawberries unappealingly squishy then I hit on the notion of strawberry cinnamon toast. Segnit is right, the combination is brilliant - not as obvious as cinnamon and apples or plums but it gives even the dullest strawberries that extra lift that makes them taste utterly delicious. Perfect for a weekend brunch - less soggy than French toast, easier than pancakes. Meanwhile toast the bread on both sides and spread one side generously with butter. Sprinkle the remaining sugar over the buttered sides. Put the slices on a baking tray under the grill and heat until the topping is bubbling. Spoon the strawberries and their juices onto the hot cinnamon toast and add a dollop of half-fat crème fraîche, fromage frais or Greek yoghurt. Eat and be happy. looks simple and delicious...thanks for sharing! 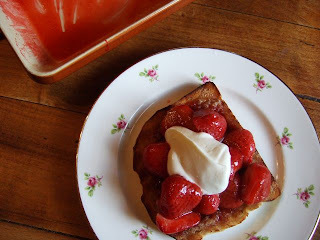 Strawberries, cinnamon & French toast- love the idea. This is something I would order at once on a brunch menu! Ah @lazza65 the point is you don't have to make the French toast which is really quite hard to get right. Just grilled buttered toast with cinnamon sugar and warm strawberries. Soooo easy! Yes, what I like about is that you don't have to make the French toast which is really sooooo calorific you feel the deposit of extra weight as you eat. Spoils the pleasure somewhat. Now I may just have to make this as the toast sprinkled with the cinnamon sugar is a new one to me and chances of finding a decent brunch type cafe in Epsom are extremely slim, sadly!